Snowshoe walks: perfect for the non-skier or skiers wanting a break from the pistes. You will discover the “real” mountains away from the crowds on the ski slopes of Meribel. 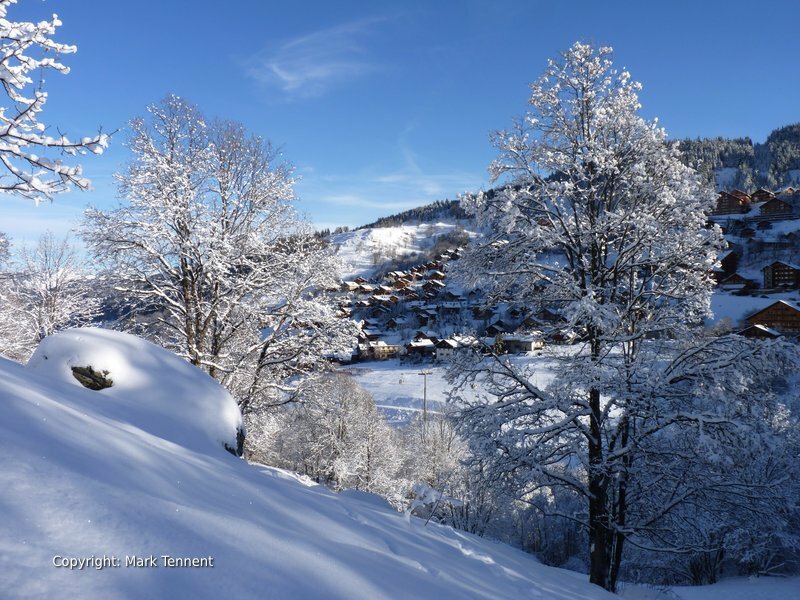 Guided snowshoe walks – Meribel – morning, afternoon or full day options available. Snowshoe walking – as relaxed or as energetic as you wish. Individuals, couples, families, groups of friends can enjoy snowshoeing together. Personally led by Mark – highly experienced and qualified International Mountain Leader / Accompagnateur en Montagne. Morning or afternoon guided snowshoe walks take place in areas closer to Meribel and Mottaret but full day trips will give you the opportunity to go to places further afield. 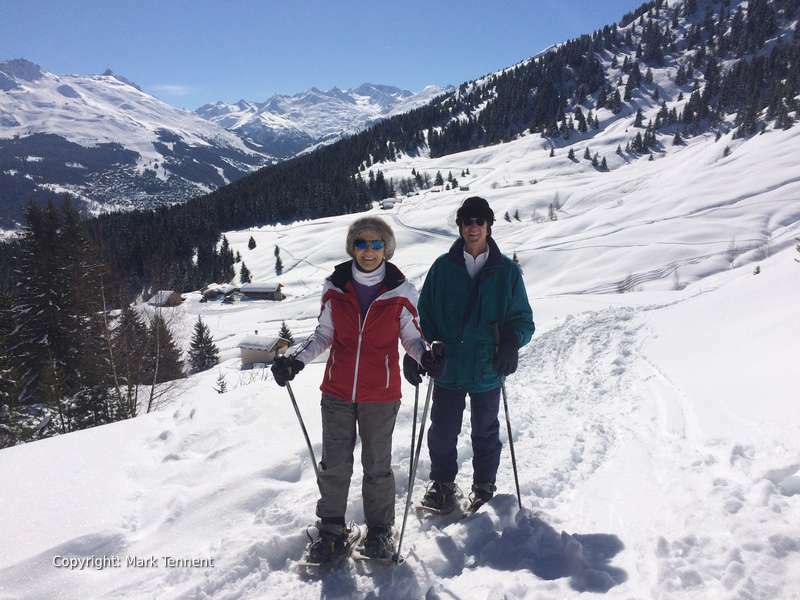 Typical full day snowshoe walks include visits to Champagny-le-Haut, the Col de la Lune and the Refuge de la Traye, the Vallon du Fruit or even Pralognan-la-Vanoise. As my snowshoe trips are “private” engagements you can be assured of personal attention. This allows me to tailor the walk to you, relaxed or more energetic. Please look at my “Private Guiding” page for my current fees. I will meet you at your hotel, chalet or other agreed meeting point. How long are Your Snowshoe Walks? Morning Snowshoe Walks: typically I will meet you between 08h30 and 09h00. I will usually say goodbye to between 12h00 and 12h30. Afternoon Snowshoe Walks: typically I will meet you between 13h30 and 14h00 and then take you back to chalet of hotel between 16h30 and 17h00. Day Long Snowshoe Walks: typically I will meet you between 08h30 and 09h00 and then drop you off at your hotel or chalet between 16h30 and 17h00. When Do Your Snowshoe Walks Take Place? I offer snowshoe walks in Courchevel, Meribel and La Tania throughout the winter ski season that runs from early December to the end of April. I run snowshoe walks everyday of the week. Please contact me to reserve a great experience. Guiding by Mark, a fully qualified accompagnateur / International Mountain Leader with over 30 years of experience in the mountains; fluent French speaker. You can find out more about my experience here. I provide you with snowshoes & ski sticks. Personal equipment i.e. clothing, footwear, etc. It’s possible to hire walking boots from certain shops in Courchevel or Meribel. What Clothing and Footwear Do I Need? Please bring the following with you: Boots (walking boots or apres-ski boots except “moon boots” or snowboarding boots); sunglasses, sunscreen, gloves, hat, ski jacket, ski salopettes or trousers, fleece jacket or jumper, a small rucsac.